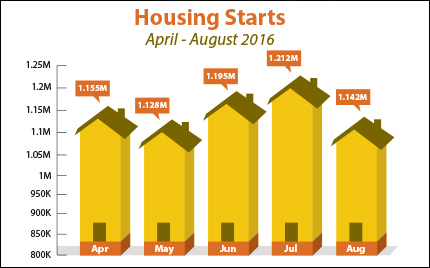 Last Week in Review: Housing Starts, Building Permits and Existing Home Sales disappoint in August. However, builder confidence remains high. Forecast for the Week: Will GDP and PCE by A-OK? View: Sharpen your focus on communication via webcam. “What a feeling.” Irene Cara. There were drops in key construction data and sales of existing homes, but builder confidence is high. If you have any questions about home loan rates or loan types, please don’t hesitate to contact me. Economic growth and inflation will be the hot topics in a data-rich week that includes housing, consumer attitudes and more. Housing data begins on Monday with New Home Sales, followed by the S&P/Case-Shiller Home Price Index on Tuesday and Pending Home Sales on Thursday. Consumer Confidence will be released Tuesday with the Consumer Sentiment Index on Friday. Durable Goods Orders will be delivered Wednesday. On Thursday, the final reading on second quarter Gross Domestic Product will be released along with weekly Initial Jobless Claims. Look for manufacturing news via the Chicago PMI on Friday. Plus, Friday brings the latest news on Personal Income, Personal Spending, and the Fed’s favorite inflation gauge, Personal Consumption Expenditures (PCE). As you can see in the chart below, Mortgage Bonds were pushed higher recently, keeping home loan rates in historically low territory. Distractions are deal killers. Clear the room, silence your phone, close out other computer applications that may ping or pop up, and close your door to help minimize intrusions. The more importance and focus you place on the other person’s experience, the better impression you’ll make. Cut Clutter. If viewers can see you, they can see your office too. Make sure your background doesn’t create visual noise. Have a clean, decluttered background to leave contacts with a good impression of your professionalism and style. Light and shadow. Make sure you are well lit from the front. If you’re overly backlit, it can appear as though you’re sitting in a darkened room, even if it looks well lit in person. Chin up! Position your webcam, so you look slightly upward into the camera instead of downward. This may require a riser for your laptop. You’ll look more natural; plus it’s a healthier position for your neck! The eyes have it. As tempting as it may be to look at the computer screen, take a cue from professional news anchors. Give the illusion of eye contact by looking at the camera as you speak, rather than at your image or the image of the person with whom you are talking. Don’t be shifty. Don’t forget they can see you. Like with face-to-face communication, your posture and body language make an impression. So sit up straight, use simple hand gestures as you talk, and resist the urge to make unnecessary movements like head scratching, fidgeting or shifting in your seat. The next time you find yourself sitting across from a webcam at home or in the office, try a few of these tips and you’ll make an even better impression!